In 1818, a strange anonymous book came into the world. The dedication to William Godwin on the inscription page provided a clue to the author’s identity—after all, Godwin was her father. Still, when Walter Scott published his famous review of Frankenstein that March, he failed to uncover either her identity or gender. He struggled to define this strange work. In the review, published in Blackwood’s Edinburgh Magazine, Scott described it as both a “novel” and “romantic fiction,” two distinct species of publication at the time. Two hundred years later, Mary Wollstonecraft Shelley’s novel still eludes generic qualifications. Frankenstein’s bicentennial inspired exhibitions, articles, and other forms of homage. For who does not know the story and the creature that somehow became greater than the novel? The creator looms outside her work’s unwaning fame, haunting it. Unlike her fellow Romantic writers—her husband Percy Bysshe Shelley; George Gordon Byron, her sometimes friend; Scott, her admiring critic—Shelley did not become a celebrity-author; only the novel was celebrated. 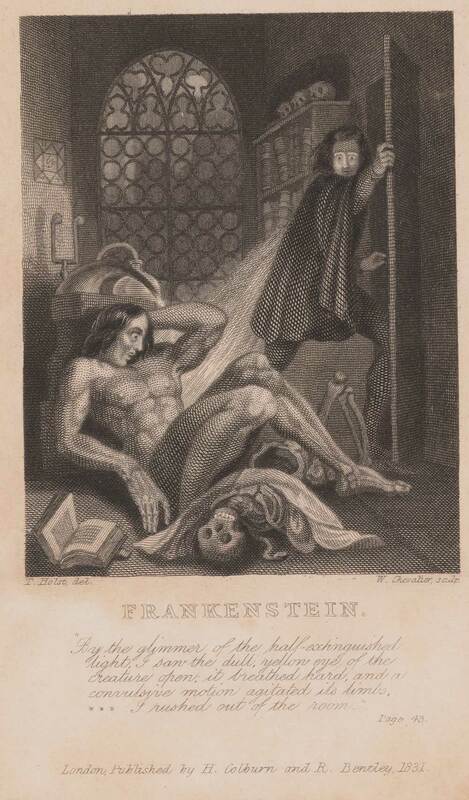 In the first edition of her fourth novel, The Last Man (1826), Shelley is credited simply as “The Author of Frankenstein.” Although she had long abandoned anonymity by then, her name was well known enough to remain omitted, and yet not important enough to work as her own book’s publicity. Maybe Shelley’s personal obscurity serves as evidence of her “original genius and happy power of expression,” as Scott described her in the 1818 review. The creation was born so powerful that it seems to have eclipsed the creator. The Ransom Center holds first editions of most of Shelley’s novels, her travel narratives, and the two P. B. Shelley posthumous poetical collections, which she edited. 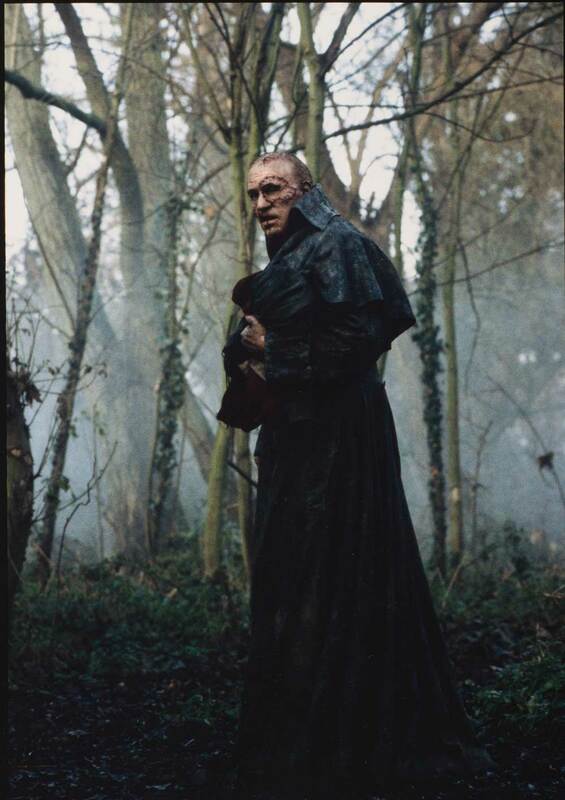 The Robert De Niro Papers have production photographs from the 1994 film Mary Shelley’s Frankenstein, directed by Kenneth Branagh. De Niro, who starred in the movie as “The Creature,” appears dramatically transformed in the pictures. His face is covered in gruesome stitches and scars, resembling the work of a butcher instead of a scientist. Since 1831, when British painter Theodor von Holst created the first widely circulated illustrations of Shelley’s masterpiece, Frankenstein has never stopped inspiring visual representations. Engravings of Holst’s art appeared first in the revised and illustrated 1831 London edition. Theodore von Holst (1810–1844), engraved by William Chevalier (1804–1866), Frontispiece in Mary Wollstonecraft Shelley (1797–1851), “Frankenstein, or, The modern Prometheus” (London: H. Colburn and R. Bentley, 1831). Wolff Collection. Additional letters and a pencil portrait sketch of P. B. Shelley, in her hand, are pasted into an imperfect copy of The Poetical Works of Coleridge, Shelley, and Keats (1829). This copy, from which Coleridge and Keats’s works have been removed, was a collector’s piece for the P. B. Shelley aficionado. The authenticity of the two letters added to this volume, from Mary Shelley to the publisher William Galignani, dated 1829 and 1830, is questioned. Shelley’s last published work is the travel narrative Rambles in Germany and Italy in 1840, 1842, and 1843 (1844). Shelley’s musings on her return to the shores of Lake Geneva evoke the dark melancholy, which only the last remaining Romantic writer could have felt in the onset of the Victorian era. Revisiting Villa Diodati and Maison Chapuis, where she conceived of Frankenstein in the company of her son William, P. B. Shelley, Claire Clairmont and Lord Byron in 1816, she felt as “the companion of the dead.” All others were gone; her child, her husband, her sister, her friend. Much like Lionel Verney, the protagonist of her fourth novel, The Last Man, Shelley survived the death of her companions from the Shelley-Byron circle. 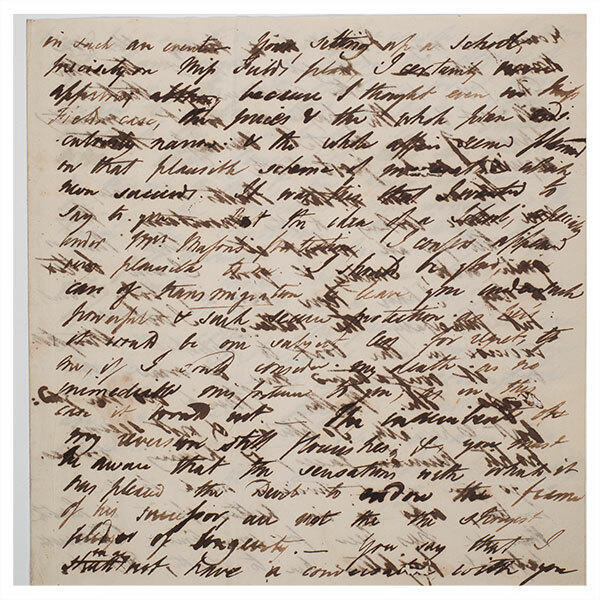 Top: Mary Shelley, letter to the publisher William Galignani, ca. 1829 or 1830, pasted into a copy of The poetical works of Coleridge, Shelley, and Keats(1829). Diana Leite is a graduate research associate at the Ransom Center and a doctoral student in the Program in Comparative Literature at The University of Texas at Austin. Leite and fellow graduate research associate Jana Zevnik curated the display Celebrating Mary Shelley: The 200th Anniversary of Frankenstein earlier this year, during the 26th Annual Conference of the Eighteenth- and Nineteenth-Century British Women Writers Association. A version of this story originally appeared in the Fall 2018 issue of Ransom Center Magazine.